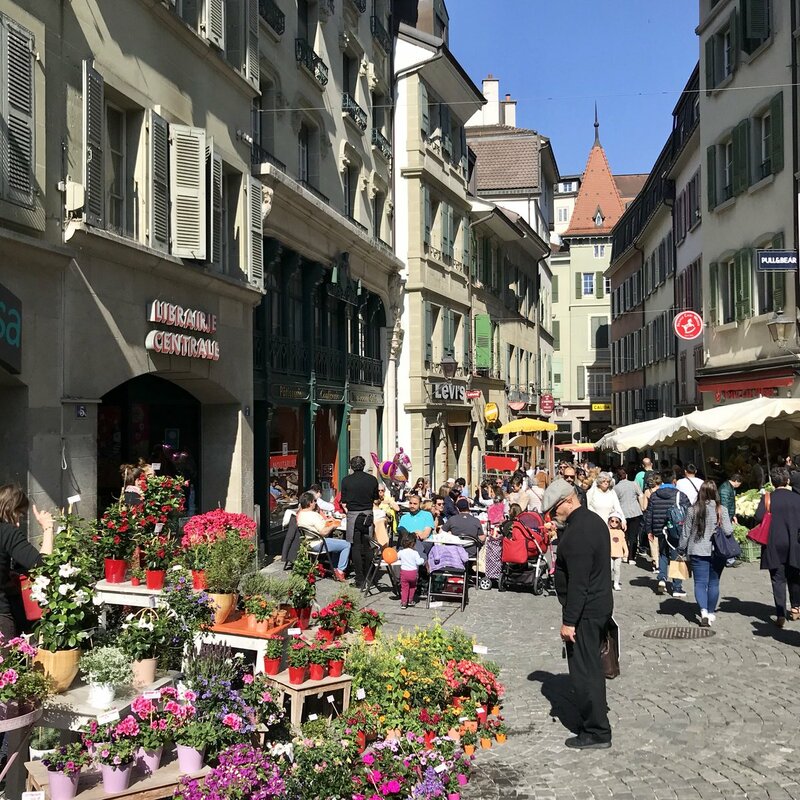 When I was invited to explore some of the best food experiences and restaurants in Lausanne, Switzerland I didn’t really know what I’d find. Usually, when I think of Lausanne I think of the Olympics and lake Geneva. I never really considered it as a foodie destination. But I put it to the test for a couple of nights to see what the city has to offer and whether or not it could cope with my vegetarianism. Here are some of my favourite foodie experiences in Lausanne. Filling up the chocolates with some passion fruit caramel at Durig Chocolatier in Lausanne. During my trip we were lucky enough to take a workshop at this wonderful chocolate shop. The workshop is about 60 minutes long. We got to choose a mould. They were in the shape of animals. I chose a squirrel, but others chose a bear and a crocodile. Then we learnt the magic process behind decorating a chocolate mould, filling a mould and setting it. While we waited in between stages our host taught us all about chocolate and let us taste some pure cacao. The Durig chocolatier’s speciality is their passion fruit caramel which we got to use to fill some chocolates. And, then, of course, we got to taste it. DELICIOUS! You don’t have to do a workshop to enjoy this place, you can just buy a tonne of chocolate. Or, do both! Either way, if you like chocolate, you have to check out Durig. This event is on every year in June. In 2019 it will be on June 8-9. You can buy a “wine passport” for just 20CHF/€17/£15. With that passport you also get a glass which you can use to try as many wines as you like at any of the vineyards in the area. They only give you a little bit of wine each time, because you’re supposed to be tasting it, not getting hammered. But the latter is inevitable given the amount of vineyards and wines available. We started drinking at around 12 and didn’t stop until 6pm maybe. They also have offers on bottles of wine if you want to pick up a souvenir to bring home. There are many different ways to make the most out of this festival. We only had one day so we got the train to Lavaux and gradually made our way down to the lake, stopping in several vineyards along the way. Some of the vineyards give you free snacks like peanuts or cheese too. The whole festival had such a great atmsophere. Everyone was out enjoying the sun and the wine. It was very relaxed. I’d highly recommend it to anyone who is fond of wine. You definitely don’t have to be a connoisseur to enjoy it. After all the drinking is done you can catch a boat (or a train) back to Lausanne. Taking in the stunning views from one of the vineyards during Les Caves Ouvertes. If you love food and drink then you’ll adore this festival. It’s a mixture of food trucks and food stalls. There is food available from all corners of the world. Peruvian, mexican, italian and more. And it’s not just food, there’s plenty of drinks too. The festival takes place in the Place de la Riponne in the centre of the city. There are long communal tables set up in the centre of the square and the stalls line the perimeter. There were lots of veggie options available too so no need to worry if you’re picky like me. I got myself a unicorn macaron from El Gato Patisserie and it was absolutely magical. I also tried some falafel, pasta, gelato and empanadas because, well, food. The festival is usually on in May but you can check the official website for further details. The Great Escape Bar is just off Place de la Riponne. It’s just up a set of stairs on Place Madeleine. It’s the PERFECT spot for a drink in the sun. It’s full of students and young people. You’ll occasionally get the smell of weed as you weave through the throngs of beautiful people to get to the bar. There is a physical bar if the weather is bad, but they have tables and chair out on the terrace over-looking the square when the weather is good. They also serve food but I didn’t taste it, I was too preoccupied with wine. It would be great for a casual date or drinks with friends. If you ever visit Lausanne, definitely check it out. My unicorn macaron that stole my heart at the MIAM food festival in Lausanne. This is the oldest restaurant in Lausanne, or so they tell me, founded in 1780. And what better place to have a Fondue?! Four of us shared a half and half fondue. A TONNE of bread came with it. We did manage to finish it but we were all absolutely stuffed. Though we did manage room for dessert. I had the peach sorbet swimming in local peach liquer. It’s a lovely rustic restaurant that is usually very popular. Luckily for us it was pretty quiet when we went there. The fondue was absolutely delicious. I highly recommend it. The Royal Savoy Hotel, where I stayed during my time in Lausanne, has a stunning rooftop bar and terrace. The Sky Lounge has spectacular views over the city and the lake. It fills up quickly so go early on a clear day (it opens from 12pm) to make sure you get a good seat. Have a cocktail, watch the world go by and breathe in that fresh air. You can sit indoors if the weather is bad but the outdoor seating area is definitely my favourite. It’s open to everyone, not just guests of the hotel. It closes at 12am, but last orders are at 10pm, which makes it perfect for a drink before you head out for the night. Some very festive cupcakes in the Royaume Melazic bakery, since we were in Lausanne for the royal wedding. The Arches are under the Grand Pont near the metro stop Flon. It’s a sort of open-front bar built into the arches under the bridge with an open terrace outside. It has a fun, relaxed vibe. When we were there a man sat on the wall with his husky, drinking pints. There were crowds of young people drinking spirits on the street outside. VERY CHILL. It’s just around the corner from D! Club too if you feel like having a full on night out. Like cupcakes? Yeah you do. Well, unless you have allergies or something. But anyway, at this cupcake shop you can participate in a cupcake making workshop. And not just cupcake making, you can do cake pop, macaron and cookies workshops too. They make smaller cupcakes than you usually see in bakeries. They’re actually the perfect size, maybe two bites. Which means you can try more than one flavour! I tried a salted caramel one and the vanilla one. They were perfect. And it’s not just all about cupcakes, they also sell adorable merchandise full of mermaids, unicorns and princesses. You can have a look at their full list of workshops here. There was an iceberg in my cocktail at Eat Me. It was a bit too strong for me. The boat that we got back from the wineries to Lausanne also hosts a FONDUE CRUISE. Yes, you heard me. The CGN boat company host a fondue cruise every Friday at certain times of the year. If there’s anything better than cruising Lake Geneva it’s cruising around Lake Geneva with a hot pot of molten cheese in front of you. You can find out more details from the website here. Prices start from 49CHF/ €42/£37. This restaurant is one of those fancy restaurants that relies heavily on its reputation and less on the actual service it provides. Having said that, the food more than makes up for the icy reception we received from the Maitre D’/restaurant manager. The “concept” of the place is like international tapas. They have small dishes from several countries around the world and you’re supposed to share. We didn’t share because a few of us had dietary requirements, which the waiter was unimpressed by, but the food was absolutely delicious. I had the hummus, the polenta and the tofu curry. And though the staff were initially a bit unpleasant they warmed up once the food arrived and I ended up loving the place by the end of the meal. I would still happily recommend it for the food, just be prepared for a bit of a cold front from the staff. My delicious salad, my first meal in Lausanne got me off to a great start. The Café de Grancy is only minutes away from the train station in Lausanne. I had a giant salad full of pesto, mozzarella, goat’s cheese, asparagus and radish. I couldn’t finish it, but it was delicious. For dessert I had the fruit salad with a scoop of sorbet. It’s a cute little place with the names of famous people and fictional characters on the back of the chairs. There was even a Princess Leia chair! Definitely a nice spot for lunch or brunch. The easiest way to get to Lausanne is to fly into Geneva and catch the train from the airport to Lausanne. The train takes around 45-50 minutes. Obviously, being Swiss, it’s all super efficient. You have to buy the ticket before you board the train. There are self-service ticket machines in the station. Tickets start from around 27CHF/€23/£20. It’s really easy to navigate. Hi there, I’m Tara. I’m a 28yr old travel blogger, photographer and occasional pharmacist living in DUBLIN. I was born in New Zealand and raised in Ireland = DUAL CITIZEN (two passports, woohoo!). Am I Kiwi? Am I Irish? Am I both? Am I neither? I’ve settled for both. I’m basically a hobbit raised by leprechauns.